Over 1000 trees felled for PM Modi’s helipad in Odisha. 1. Hundreds of trees felled to make space for PM’s helipad. 2. Irreparable loss: 1000 trees cut in Odisha to build a helipad for PM Modi’s arrival. A story in wide circulation in media outlets and social sites talks about Over 1000 Trees Felled for PM Modi’s Helipad in Odisha. While some said thousands of fully grown trees were cut, others mentioned over 3000 trees were cut down to construct Helipad for PM Modi’s arrival. Indian Prime Minister Narendra Modi visited Balangir on 15th of January 2019 to inaugurate Khurda-Balangir railway line and launch a host of projects in Odisha thereafter. However, the viral ‘news’ about the heavy deforestation involving over 1000 Trees felled for PM Modi’s Helipad is Not True. On 14th Jan. 2019, The Week website published a PTI report suggesting “Days before Modi’s Odisha visit, felling of trees for helipad sparks row“. It mentioned Divisional Forest Officer (DFO), Balangir, Sameer Satpathy to have said several trees were felled near the railway station ground to prepare a temporary helipad for Modi’s visit without obtaining prior permission. Satpathy also said an inquiry has been ordered in that regard. Subsequently, the stories about 1000 Trees felled for PM Modi’s Helipad surfaced online. Even many national mainstream news outlets mentioned it without proper verification, citing what DFO Sameer Satpathy said. The aforementioned PTI report also mentioned Assistant Conservator of Forests (ACF) Babaji Charan Raul to have said a team will visit the site to ascertain the number of trees felled in the area. The area in question near Balangir railway station comes under the jurisdiction of the Railways. Railways officer J.P. Mishra said they are inquiring on the subject, adding that preparation of such a helipad is the task of the public works department (PWD) of the state government. Nowhere, the initial reports mentioned about 1000 Trees felled for PM Modi’s Helipad. As a matter of fact, under the orders of district administration, the PWD workers pruned some of the trees to make way for Helipad and provide security for PM’s visit. Few plants and shrubs were also removed. Times of India Bhubaneswar confirmed the same, mentioning a report from East Coast Railway spokesperson. They also shared a January 7 video prior to helipad making, which shows there were no big trees on the spot. India Today website shared some images from the Helipad site showing felling of some plants and few trees. More importantly, they also shared an old (November 2018) and latest Google Earth images of the temporary helipad location – clarifying it was a vacant land. So, the ‘news’ messages about 1000 Trees felled for PM Modi’s Helipad making are hoaxes. Responding to the controversy, ruling Biju Janata Dal party member and Rajya Sabha MP Prasanta Nanda said, “He is the PM. Whenever he goes somewhere, state governments have to provide security. Odisha has always taken the necessary steps in this regard. If trees need to be felled (for his security), the state government can take an appropriate decision”. 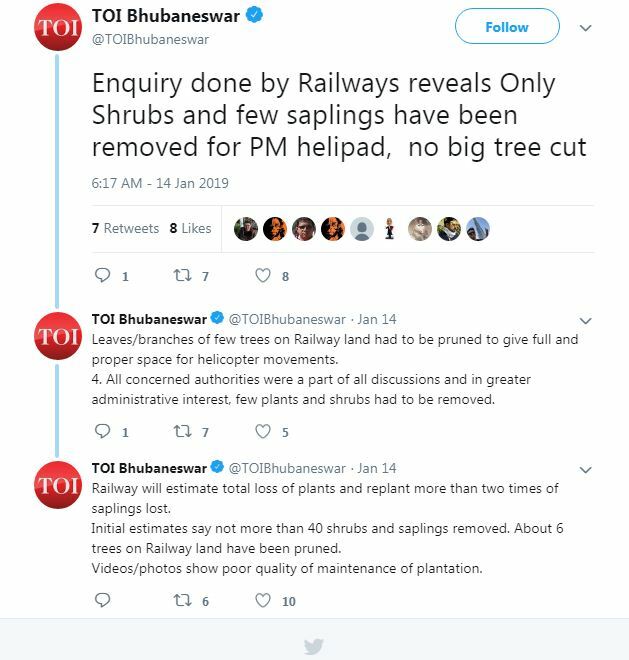 On the other hand, reports suggest, the Railway Department will again plant saplings on the land after the PM Modi’s visit. Earlier, in November 2018, the Odisha government fell hundreds of trees in Dhenkanal district to clear land for setting up a beer making unit. Political parties and local people criticized the government severely. Local women, using Chipko movement, protested the tree cutting and clashed with police and local administration.